Originally published in 1988, Getting the Love You Want has helped millions of couples attain more loving, supportive, and deeply satisfying relationships. The 20th anniversary edition contains extensive revisions to this groundbreaking book, with a new chapter, new exercises, and a foreword detailing Dr. Originally published in 1988, Getting the Love You Want has helped millions of couples attain more loving, supportive, and deeply satisfying relationships. 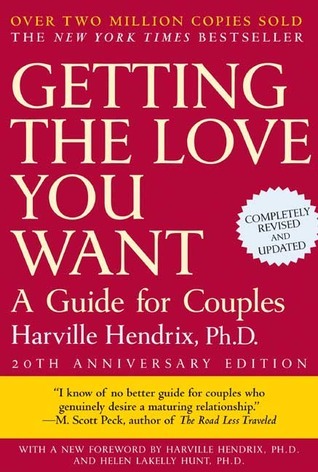 The 20th anniversary edition contains extensive revisions to this groundbreaking book, with a new chapter, new exercises, and a foreword detailing Dr. Hendrix’s updated philosophy for eliminating all negativity from couples’ daily interactions, allowing readers of the 2008 edition to benefit from his ongoing discoveries during his last two decades of work. Harville Hendrix, Ph.D., in partnership with his wife, Helen LaKelly Hunt, PhD., originated Imago Relationship Therapy, a unique healing process for couples, prospective couples, and parents. Together they have more than thirty years’ experience as educators and therapists and their work has been translated into more than 50 languages, with Imago practiced by two thousand therapists worldwide. Harville and Helen have six children and live in New York and New Mexico. To ask other readers questions about Getting the Love You Want, please sign up. Gregory Eccles Absolutely! Even if only one of you reads it, it can only help! This was an assigned book and not one that I would normally read. The officiant my fiancee and I chose for our wedding is both a minister and a therapist and he asked that we read this book as part of the counseling he requires for all couples he officiates for. It is not a dreadful book and there are some good thoughts in it. However, as a sociologist, I have substantial issues with certain aspects of this book, of which I will outline three below. First: the authors tend to use "global" terms li This was an assigned book and not one that I would normally read. The officiant my fiancee and I chose for our wedding is both a minister and a therapist and he asked that we read this book as part of the counseling he requires for all couples he officiates for. First: the authors tend to use "global" terms like "everyone". However, their analysis is based not on a random survey of individuals (either in the US or globally) but on couples that came to them for marriage counseling. In the social sciences this is called "selecting on the dependent variable". That is, they are generalizing across couples who are seeking help, not all couples whose marriage is in trouble or let alone all couples (including happily married ones). Their model should be tested against happily married couples. If happily married couples are inherently doing the kinds of things the authors think that all couples should be doing, this would strengthen their hypotheses. Second: as a sociologist, I am frustrated with the individualist orientation of the authors. This is a common cultural trait of Americans in general and Baby Boomers *in particular*. The authors at time come close to recognizing that married couples are not separate from their home culture but are intimately bound up with it. This is to say, what couples think of as feasible and desirable isn't just a product either of individual history and/or biological factors but also comes down from observing media, what friends are doing, and so forth. Third: I do respect the authors' attempts to move beyond the "self-actualization" paradigm. I think that in the coming decades American culture will continue to critique and move past the ideology of hyper-individualism (reigning especially from the late 1950s-1980s). I am not a communitarian or a libertarian - I think that neither pure individualism or pure communitarianism is the answer. That this book made an effort to do so is commendable, but there is much farther yet to go. Again, I think this book is speaking primarily to Baby Boomers, and I wonder how different Gen Xers and millennials are with respect to marriage. I just gave four stars to a freaking self-help book. That says everything. READ IT. Really, though, this book's relevance surprised me, cynic that I am about this kind of book. Harville Hendrix is heavy on the nuance and light on the cheese, and his descriptions of "fusers" and "isolaters" are incredibly useful. (I determined I'm switchy with a lean towards "fuser".) And the exersizes are pretty cool, too. I tend to be ambivalent when it comes to the self-help genre. It's natural for someone in my field to feel this way, and my views have also been influenced by books like Sham: How the Self-Help Movement Made America Helpless and I'm Dysfunctional, You're Dysfunctional: The Recovery Movement and Other Self-Help. And yet, there are a few self-help books which speak to me and offer language for speaking to my clients. Overall, this was one of them. Interestingly enough, I heard a speech at my synago I tend to be ambivalent when it comes to the self-help genre. It's natural for someone in my field to feel this way, and my views have also been influenced by books like Sham: How the Self-Help Movement Made America Helpless and I'm Dysfunctional, You're Dysfunctional: The Recovery Movement and Other Self-Help. And yet, there are a few self-help books which speak to me and offer language for speaking to my clients. Overall, this was one of them. Interestingly enough, I heard a speech at my synagogue over the weekend commenting that self-help books offer no new advice and are useless unless the reader commits himself to accepting responsibility for his choices. In fact this book's advice is arguably not new -- its points rest on the age-old premise that the only way to change your marriage is to stop trying to change your spouse and to work instead on your own issues. At the same time, the book offers some interesting insights in a highly readable tone, and even better, details several practical exercises to be done with or without your spouse, independent of a therapist, which can enhance your marriage. You need a bit of a tolerance for psychspeak dialogue, but the exercises were interesting and many sounded like they could be helpful. I found myself thinking back on several of the couples I've worked with and wishing I could have shared some of the information in this book with them. This book makes sense, but is also really frustrating. The main point, that couples fight because of unfulfilled childhood issues, makes sense (to a point) as do his solutions. I really like some of the exercise ideas, even though I have a sneaking suspicion I am too lazy to do them with my spouse, but I think they will work in diffusing student complaints. What's frustrating? . . . the gender norms expressed in the book. All too often, examples suggest women are (overly) talkative and emotional This book makes sense, but is also really frustrating. The main point, that couples fight because of unfulfilled childhood issues, makes sense (to a point) as do his solutions. I really like some of the exercise ideas, even though I have a sneaking suspicion I am too lazy to do them with my spouse, but I think they will work in diffusing student complaints. What's frustrating? . . . the gender norms expressed in the book. All too often, examples suggest women are (overly) talkative and emotional, and quick to anger, but not in touch with their sexual desires. This is nonsense. I really don't know that many women who fit the stereotype of women as all emotional, wearing their hearts on their sleeves and sexually repressed. On the other hand, a lot of my male companions fit that bill. It's time for the editor and writers to interrogate their examples and flip the gendering around to make this book more for REAL people. I remember years ago, when my marriage was heading south, picking up this book and halfheartedly trying the exercises- knowing my ex would not want to have any part of it. I still wish I'd read it at that point or after- my marriage would have likely still failed, but I may have been better prepared for the love that came after. While I think that simply reducing relationships and areas for conflict to unresolved childhood wounds is a bit simplistic on its own, a lot of this made sense- at least I remember years ago, when my marriage was heading south, picking up this book and halfheartedly trying the exercises- knowing my ex would not want to have any part of it. I still wish I'd read it at that point or after- my marriage would have likely still failed, but I may have been better prepared for the love that came after. While I think that simply reducing relationships and areas for conflict to unresolved childhood wounds is a bit simplistic on its own, a lot of this made sense- at least for mass relationship counseling through paperback. It made sense why I am attracted to men who I feel like I get a special secret by loving them that nobody else gets to see- why I fall in love with those who will handle conflict or my overwhelming them with large emotions and with what I rationally know to be unfounded or unrealistic claims or expectations by withdrawing or running away- my biggest abandonment/you need to handle it on your own fears realized. I wish I had had the vocabulary earlier to articulate that sometimes I don't need to be right (in fact, often I know what I'm saying or interpreting is absolutely ridiculous! ), but I do need someone who will validate and affirm they understand and support that I have those feelings to help me work through them. And I need the validation from the kind of person who does not know how or does not want to give it to me. It's really key for me- and it comes from parents who loved me (and I always knew it intellectually, but didn't often feel it) but invalidated my feelings from a pretty early age too. It's funny that when in instances where I get that validation early on, I am currently discovering I need it less than I thought I did. I've noticed this in my professional life, but never connected the dots before. I tend to choose people who are more passive about their lives- and I want to activate them, but at the same time I value that they can just be calm and live in the moment more than I can. I have to admit that I did not finish reading this book. This is rare for me -- usually I will doggedly slog through whatever book I choose to pick up, no matter how bad it turns out to be. So please understand what a thorough aversion I must have had to abandon this book after only ten days and a few chapters. I gave it my best effort, really I did. But the love-seeking process described in this book struck me as so inherently selfish and self-serving as to leave me completely disinterested and I have to admit that I did not finish reading this book. This is rare for me -- usually I will doggedly slog through whatever book I choose to pick up, no matter how bad it turns out to be. So please understand what a thorough aversion I must have had to abandon this book after only ten days and a few chapters. I gave it my best effort, really I did. But the love-seeking process described in this book struck me as so inherently selfish and self-serving as to leave me completely disinterested and even a bit turned off. The love process is not about one versus another, but about two people coming together. In its attempt to provide evidence of a clinical process, this book strips the love scenario of any sense of togetherness and instead, unintentionally (it would seem), creates an adversarial scenario. I'm also not a huge fan of regressive psychology. Sure, our childhoods have colored who we have become as adults, but I think that focusing too heavily on the past stands in the way of focusing on steps necessary for the future. Reading this book, I continually found myself frustrated by this limited perspective, and searching for more practical applications to the struggles I'm facing today and don't fully understand, rather than the childhood experiences with which I'm already familiar. This review has been hidden because it contains spoilers. To view it, click here. My sister a social worker/therapist recommended this book years ago and I bought it. It sat on my "to read" shelf for years until a Marriage and Family professor mentioned again in his talk at Sunstone. It has a clear and powerful premise. Our childhood and relationship with our parents subconsciously influences who we are attracted to and marry. We have the feeling this person will make us whole. After the romantic phase wears off and most couple slip into the power struggle phase where it is p My sister a social worker/therapist recommended this book years ago and I bought it. It sat on my "to read" shelf for years until a Marriage and Family professor mentioned again in his talk at Sunstone. It has a clear and powerful premise. Our childhood and relationship with our parents subconsciously influences who we are attracted to and marry. We have the feeling this person will make us whole. After the romantic phase wears off and most couple slip into the power struggle phase where it is painfully clear that this person is not making us as whole as we would like to be. The author is a psychologist who has worked with couples for many decades. The method he has developed it to help couples identify what it is that they crave most in their lives. He spends most of the book leading you to his conclusion that I found very powerful. It is that what will become most whole when we are able to learn what are partner needs and provide it for them. He suggests that we may have subconsciously picked a partner that can best help us change to become a more complete person. That this process of transformation that we undergo to meet our partners needs will make us whole. This was a unique and powerful concept that I had never considered before. This book contains some good relationship advice and useful exercises. The author is a couples therapist with over 20 years of experience, whose wife is also a therapist. I found the book too heavy on psychoanalysis; it keeps talking about the wounded child in each of us, and how we select our partners because we subconsciously seek our parents (or other childhood caretakers). It starts slow and is much longer than I think is necessary; several anecdotes could be removed. I almost gave up several This book contains some good relationship advice and useful exercises. The author is a couples therapist with over 20 years of experience, whose wife is also a therapist. I found the book too heavy on psychoanalysis; it keeps talking about the wounded child in each of us, and how we select our partners because we subconsciously seek our parents (or other childhood caretakers). It starts slow and is much longer than I think is necessary; several anecdotes could be removed. I almost gave up several times before it started getting interesting halfway through (around chapter 7). The author was formerly a Baptist pastor. He advocates for lifelong committed relationships. See your partner as a wounded child seeking “salvation.” Redesign your relationship to heal these wounds. 1. Build atmosphere of safety and trust. Close your exits, renew your commitment, and deliberately please each other. Communicate openly and effectively. Accept the negative and positive in yourself. 2. After learning about your partner, become their healer. Focus on their needs rather than yours. By healing your partner, you’ll heal yourself. You’ll learn that behind sadness, anxiety, and frustration are pain, rage, and fear of death. 3. Find a safe and growth-producing way to express emotions so they don’t jeopardize relationship. The emotions will move from unconsciousness to consciousness. You will experience unity and wholeness. • Add in surprise acts. • Add in fun physical activities. 1. Mirror: paraphrase what your partner said, with same emotion. 2. Validate: confirm that their thought process makes sense from their perspective. You don't have to agree with them. 3. Empathize: confirm that you understand their emotions. Connection is the main requirements for a healthy relationship. Safety is required to form a connection. We unconsciously seek a mate with negative and positive traits that match our parents. The negative traits usually outweigh the positive. People can be isolators or fusers, and they often marry each other. Isolator: someone who unconsciously pushes others away, keeps people at a distance, need a lot of space, and wants freedom in a relationship. Fuser: person who need closeness, wants to do things together all the time, craves physical affection and reassurance, and often needs to stay in constant verbal contact. When we criticize our partner, we may be revealing an unmet need, or revealing one of our own deficiencies. Behavior Change Request: Give each other SMART goals. I was shocked after reading this because I realized how right the writer was about mixing our childhood wounds with the needs we expect to be fulfilled through our marriage. This led me to see things through an entirely different light, not so positive for me, and made me realize my own mistakes instead of being critical of my husband all the time. "I have found this phenomenon in many of my clients. They react to their partners as if they were carbon copies of their parents, even though not all of their traits are the same. In their compelling need to work on unfinished business, they project the missing parental traits onto their partners. Then, by treating their partners as if they actually had these traits, they manage to provoke the desired response." That said, the book was also filled with a lot of redundant information IMO (especially the first 4 chapters) and also -my mistake for not understanding this from the title alone- addressed to couples; you can't do the exercises on your own, you need your spouse to read this and do them with you. I will plan however to use the knowledge found here to try and moderate my own behavior and thought patterns; I already see my husband in a more positive and compassionate light than I did before reading this. This book is revolutionary,this is A Must-read for Everyone! Every relationship you would have as an adult is affected by your childhood and your relationship with your parents or caregivers. They would have tried their best to treat and raise them This book is revolutionary,this is A Must-read for Everyone! They would have tried their best to treat and raise them right! My husband and I agreed to read this book over the summer. Written by an experienced marriage counsellor, the book is broken into three parts. The first section illustrates why people are attracted to each other and the reasons why relationships become unhealthy. After reading the first part, I wondered how it was possible for anyone to have a healthy relationship. The second section outlines the conscious steps we need to take to carve out a healthy relationship. As I was reading these pages, I My husband and I agreed to read this book over the summer. Written by an experienced marriage counsellor, the book is broken into three parts. The first section illustrates why people are attracted to each other and the reasons why relationships become unhealthy. After reading the first part, I wondered how it was possible for anyone to have a healthy relationship. The second section outlines the conscious steps we need to take to carve out a healthy relationship. As I was reading these pages, I felt challenged and - at the same time - wondered if I was up to the task. I could see, in reading this part, how difficult it is for Ken and me to listen to each other when our buttons are getting pushed. There are several practical elements to the second section. Practical exercises make up the third part of the book. فرضية وهي ما أظن إنها حقيقةٌ مثبة ..
من خلال البحث والتجوال في الطفل القابع بداخلك ..
والعمل على منحه ما قد فقده من أقرباءه ..
والتي تحث على تحسين نفسك بدلاً من تحسين علاقتكم ببعضكم البعض ..
ولا يخفى عنا .. كون الكتاب ملحق بعدد من التمارين المفيدة في كشف علاقة المشكلة الحالية .. بمشاكلنا الطفولية ..
هذا ما فصله الكاتب بشكل سلس و محبب بأن صراعاتنا الزوجية و أساس انجذابنا لشركاء حياتنا يكمن في تجارب الطفولة ولكي نحظى بعلاقة تتميز بالالتحام الروحي والحب فيجب على كلا الشريكين معالجة جراح الآخر وحين يفعل هذا سيكون قد عالج بعضاً من صفاته الذميمة في نفس الوقت. أرفق الكاتب تمارين عملية في نهاية الكتاب ليطبقها الأزواج وهذا أضاف قيمة للكتاب بالنسبة لي ، لان معظم كتب المساعدة الذاتية تكون عادةً مقالية. I found this book really insightful. It made me think about where I come from and the influences that affect my relationships, especially with my wife. It revealed a lot of things about me that I hadn't considered before. I would recommend this to anyone. You don't have to be married to learn from it. I highly recommend this book to any couple serious about making their long term relationship thrive. It's clear, logical, and provides real-world techniques for developing the interpersonal skills that can take a marriage beyond the blahs to regain and enrich the love that was there from the beginning. After two failed marriages, I know that reading this book has better equipped me for my next relationship. PS: it takes both parties committing to the deal. Read the book; you won't regret it. There are valuable ideas here, but I have a hard time getting behind some of the premises. In particular, I'm unable to draw many parallels between the traits of my parents and the traits of my husband. (Maybe people who know us can point to them!) I would like to try the exercises, so my opinion may change if/when that process is complete. This review has been hidden because it contains spoilers. To view it, click here. Another important and helpful book about relationships. Because I'm not currently in partnership, I didn't attempt to do the exercises in the last part of the book, but I read through them and saw how they could be helpful to partners in struggle. The book does describe in detail how the exercises work and what they're supposed to accomplish, so I got a good understanding theoretically about the exercises, but know that doing them would be even more powerful. "Above all else, we seek connection- Another important and helpful book about relationships. Because I'm not currently in partnership, I didn't attempt to do the exercises in the last part of the book, but I read through them and saw how they could be helpful to partners in struggle. The book does describe in detail how the exercises work and what they're supposed to accomplish, so I got a good understanding theoretically about the exercises, but know that doing them would be even more powerful. 1. Your 'lost self,' those parts of your being that you had to repress because of the demands of society. 2. Your 'false self,' the facade that you erected in order to fill the void created by this repression and by a lack of adequate nurturing. 3. Your 'disowned self,' the negative parts of your false self that met with disapproval and were therefore denied. 1. Stir up each other's repressed behaviors and feelings. 2. Reinjure each other's childhood wounds. 3. Project their own negative traits onto each other. 1. You realize that your love relationship has a hidden purpose--the healing of childhood wounds. 2. You create a more accurate image of your partner. 3. You take responsibility for communicating your needs and desires to your partner. 4. You become more intentional in your interactions. 5. You learn to value your partner's needs and wishes as highly as you value your own. 6. You embrace the dark side of your personality. 7. You learn new techniques to satisfy your basic needs and desires. 8. You search within yourself for the strengths and abilities you are lacking. 9. You become more aware of your drive to be loving and whole and united with the universe. "Principle 1: Most of your partner's criticisms of you have some basis in reality. - How do I feel when my partner acts this way? - What thoughts do I have when my partner acts this way? - What deeper feelings might underlie these thoughts and feelings? - Did I ever have these thoughts and feeling when I was a child? Principle 2: Many of your repetitious, emotional criticisms of your partner are disguised statements of your own unmet needs. Principle 3: Some of your repetitive, emotional criticisms of your partner may be an accurate description of a disowned part of yourself. I was assigned this book by the owner of the company I just started working for. I downloaded the audio version from audible.com and it took me several days to make it through this book. Apparently the version I listened to had been updated to make it more palatable toward non-traditional relationships, they also removed a section that they discovered was actually I was assigned this book by the owner of the company I just started working for. I downloaded the audio version from audible.com and it took me several days to make it through this book. Apparently the version I listened to had been updated to make it more palatable toward non-traditional relationships, they also removed a section that they discovered was actually causing more issues than it was solving. The summary of the book is that emotional training occurring from birth leads to your mate selection and then triggers issues once the relationship leaves it's honeymoon phase. Everyone is subconsciously looking for the person who will return them to a whole state, but since we each feel broken our selected mate has the same needs from us... But they tend to clash - reopening old wounds that trigger pain and often battles. The book contains several exercises to help partners work through these tough issues. I could relate to many aspects of this book but wonder if it's similar to reading a book of medical ailments and being sure you have most of them! Human nature is fascinating and perhaps the reason self help books have boomed is because we all have insecurities & dark sides that we would like to transcend somehow...but is this realistic? And that's really my question with this book...is it realistic to expect to create a near perfect relationship...after all...we are all imperfect and nothin I could relate to many aspects of this book but wonder if it's similar to reading a book of medical ailments and being sure you have most of them! Human nature is fascinating and perhaps the reason self help books have boomed is because we all have insecurities & dark sides that we would like to transcend somehow...but is this realistic? And that's really my question with this book...is it realistic to expect to create a near perfect relationship...after all...we are all imperfect and nothing we do will ever change that. I'm sure improvements can be made and I don't deny there is interesting insights into the power struggles you get into in relationships & what maybe behind them but I'm always wary of authors of self help books describing how perfect/ideal things are going to be once you've just followed all the steps...really?? My number one problem however is that I just feel silly talking in the prescribed 'therapeutic' way. Surely someone could come up with a similar practice of being able to listen & empathise that sounds like normal people speaking instead of it sounding so weird and fake...I don't feel listened to I just feel like you're trying your techniques on me?! It's too bizarre!! Hendrix and I have preaching and church ministry as a young adult in common. I love this about him. What I don't love is that his psychology model is born of psychoanalytic and Freudian models. He believes that we marry unconsciously to heal the wounds that our early lives have inflicted upon us, and that good marriages heal those wounds. I believe instead that we marry others who feel instinctively familiar, like family, to us. In both good and bad ways. And that is our own work, our individual, relational and spiritual work, to heal our wounds. I think that is too heavy a load to lay on one relationship, particularly your spouse! I despise the use of filler in books. My advice to non-fiction authors would be "just get to the damn point!" Much of this book is filler. Still, it has useful information, such that I recommend reading it for anyone who is in a relationship, whether that relationship be a great one or a tense one, or in between those two. It describes what we (unconsciously) look for in a partner and why. It describes written and verbal exercises couples can do together to improve communication. These alone mak I despise the use of filler in books. My advice to non-fiction authors would be "just get to the damn point!" Much of this book is filler. Still, it has useful information, such that I recommend reading it for anyone who is in a relationship, whether that relationship be a great one or a tense one, or in between those two. It describes what we (unconsciously) look for in a partner and why. It describes written and verbal exercises couples can do together to improve communication. These alone make it a worthwhile read, despite all of the filler. I am going through the exercises with my partner, and I can see that if you're consciously trying to incorporate this book's wisdom into your life, your relationship will improve. This book was so eye opening for me. I love the solid mix of psychological theories; the author has a great handle on the psyche and has explained his ideas and beliefs in clear common languange. This book is for anyone! For couples, for single people looking for a relationship, for married individuals searching alone to better their relationship... basically anyone could benefit from reading this book. My husband and I are reading through the book and though it has only been a short time, my ey This book was so eye opening for me. I love the solid mix of psychological theories; the author has a great handle on the psyche and has explained his ideas and beliefs in clear common languange. This book is for anyone! For couples, for single people looking for a relationship, for married individuals searching alone to better their relationship... basically anyone could benefit from reading this book. Harville Hendrix, Ph.D., is the author of Getting the Love You Want: A Guide for Couples, a New York Times bestseller that has sold more than two million copies. He has more than thirty years’ experience as an educator and therapist. He specializes in working with couples in private practice, teaching marital therapy to therapists, and conducting couples workshops across the country. Dr. Hendrix i Harville Hendrix, Ph.D., is the author of Getting the Love You Want: A Guide for Couples, a New York Times bestseller that has sold more than two million copies. He has more than thirty years’ experience as an educator and therapist. He specializes in working with couples in private practice, teaching marital therapy to therapists, and conducting couples workshops across the country. Dr. Hendrix is the founder/director of the Imago Institute for Relationship Therapy. He lives in New Jersey and New Mexico.